Unit Dose Packaging makes it easy for patients and caregivers to manage drug regimens in order to prevent missing doses or overdosing. 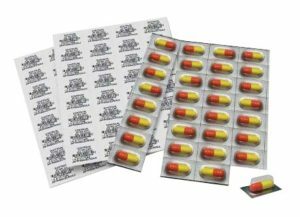 We seal your medication into numerically organized bubble packs (the punch-out bubbles are labeled #1-31 on the back, corresponding with the days of the month) so you can keep track of exactly what medication you need to take on any given day, and each pack is labeled with the time you should take it. If you need to take one medication twice a day, you will get two separate packs, each appropriately labeled with the hour you should consume them. For multiple medications, the pharmacy can dispense multiple AM/PM/bedtime packs or combine up to 3 kinds of medication per bubble for different time intervals.